IT Center Video Chat Script 2. Wlpp Video Chat Script is offering you a complete pay-per-view videochat website. Live communication chat server application solves all the queries of your online visitors with the technical support executives of your company. Online live chat software is fast and effective customer support application that offers secure and dedicated connection between website visitors and support executives. Magic Blog, a simple yet sophisticated blog, is the world's easiest to use blog software. There is no need to register or login, or even submit. Magic Blog uses cutting edge Ajax technology to automatically submit posts and they appear immediately. How can you communicate online your personal or official query to multiple friends or clients! PHP - Java Chat system for web site. Client is Java applet can run in any Java enabled browsers. The server side is PHP script can be installed on any PHP enabled web host. Interface text can be customized in any language. Multi rooms. Software for Dating is the best php script package Datetopia provides for online singles & couples dating, various niche matchmaking services, social networking, adult videochat community websites. Cross platform Video Chat Software that includes payment processers, numerous fully brandable customizable template website. Adaptable for virtually any niche or industry incl Adult. Powerful management & statistical analysis functions. 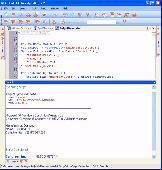 The Admin Script Editor is an editor designed specifically for Windows Administrators. It even provides the ability to create a secure EXE file from your script, which may include any required support files.